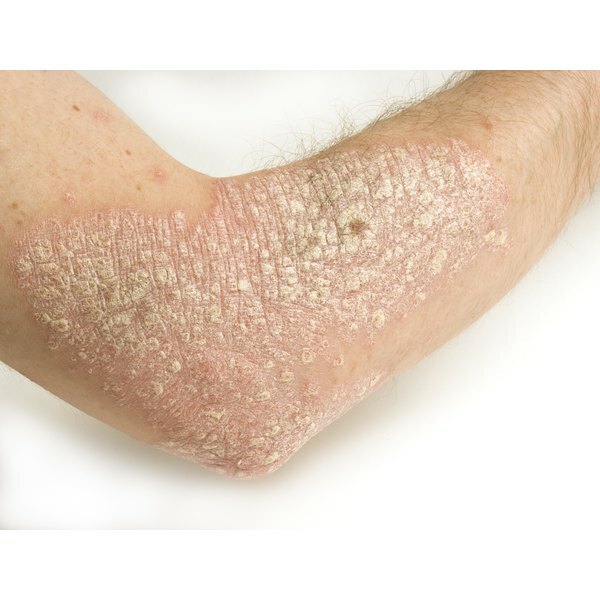 Eczema and psoriasis are skin conditions that can share similar symptoms, such as irritation and inflammation, but they are separate diseases. There is no cure for these conditions, but topical treatments and medications exist, and some individuals find that herbal supplements and teas can relieve symptoms. Before using these teas for your eczema or psoriasis, talk with your doctor about whether these may be appropriate treatments for your skin condition and whether they can interact with any medication you currently take. Make burdock root tea with 2 to 6 g of burdock root steeped in approximately 2 cups of water, and drink this three times daily, recommends the University of Maryland Medical Center. Burdock root has been shown to be effective in treating symptoms of eczema, acne and psoriasis. Ask your health-care provider if red clover tea may be helpful. The University of Maryland Medical Center states that red clover is effective in treating eczema or psoriasis, and the tea may be prepared by using 1 to 2 tsp. of dried flowers steeped in 8 oz. of hot water, and drink two to three cups daily. Drink green tea every day. Green tea may help reduce inflammation and itching associated with eczema. Suggested dosages range from three to 10 cups daily. Ask your health-care provider what a safe amount of this tea would be for your situation. Use any medications that have been prescribed for your eczema or psoriasis as needed. Before using any teas to treat your skin conditions, ask your health-care provider if it is safe for you to consume these teas. Although they are made from herbs and natural substances, they can interact with medications and medical conditions and cause adverse effects.